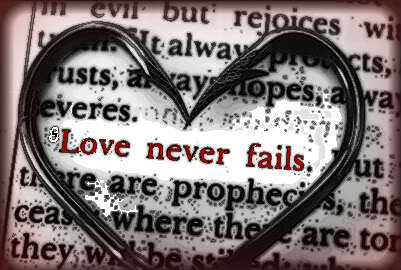 Love never fails, and My love for you is unfailing, says the LORD. I Am love, and the lover of your soul. My love for you is unstoppable and unchangeable regardless of the circumstances that you are in. I remain the same. I cannot fail, and I will not fail you, says the LORD. I Am faithful and true, always. When others abandon you and all else fails you, I remain unfailing, and you can depend upon Me. You are precious and priceless in My sight, and you are constantly in My thoughts. I never have you out of My sight. Nothing can separate Me from you, and there is no power that can separate you from My unfailing love for you, says the LORD. I Am your trusted friend that sticks closer than a brother. Trust in Me at all times, for I will never disappoint you. I love to have fellowship with you and want to have you close to Me always. Come and let Me embrace you and give you My comfort and peace. I will sing a love song over you and lavish My love upon you. I will never give you less than everything that you need as you entrust your life to My love and care for you. I created you to have intimate fellowship with Me, and I joy over you constantly, says the LORD. Come closer to Me. I want you to be nearer. Feel My breath upon you and let Me fill you with My unspeakable joy as you come into My presence and receive all that I have for you there, says the LORD.